The Hallel and Hoshanas are said every day of the Jewish festival of Sukot (Feast of Booths, Tabernacles). On each of these days, except for Shabbat, the four species (Arba Minim, lulav and etrog, or ארבע מינים in Hebrew) are held together and waved. The four species consist of one kind of fruit and three types of branches. The fruit is the lemon-like etrog, or citron, and is the costliest and the most fragile of the four species. Therefore it is customary to acquire a special box to protect the etrog. This is because on the tip opposite the stem most etrogs have what is called a 'pitam', a knoblike extension which can easily break off. If it does, the etrog is no longer kosher and cannot be used. 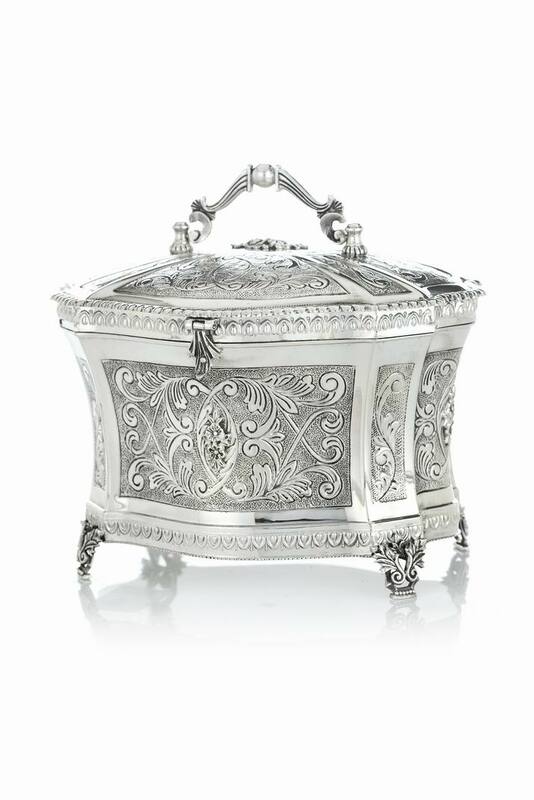 This chest shaped silver box will protect your precious esrog during the Sukkot Holiday, which is a time for rejoicing, and not for worry. During the rest of the year it will reflect your unerring taste within your silver collection. The chest stands on ornate, leaf carved silver legs, which are directly below the narrow panels at the corners of the chest. The bottom of the silver box is surrounded by a very narrow rope like decoration, topped with a band of upside down arches. Above this band, both the wide and the narrow panels of the chest are each surrounded by a smooth silver band which serves to highlight the Italian style leaf scrollwork. In the center of each panel, the branches cross to surround two perfectly etched flowers. The same design is repeated on the gently curved dome of the cover of the box. The sides of the cover repeat the arch motif, this time facing downwards. The cover is securely hinged to the bottom, and closes with a latch, which echoes the detailed work of the legs of the box.